Shuswap is a great place to learn to climb. From here you have climbing areas in all directions including World Class Squamish (5-6 hours) Skaha in Penticton (3 hours) Revelstoke (1 hour) the Canadian Rockies (4 hours) or the Bugaboos (5-7 hours ?). 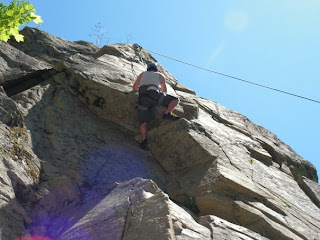 All of which are amazing for both rock climbing and mountaineering. Ice climbing is also a possibility. Our centralized location is what makes climbing here so great. If I say, lived in Canmore, Alberta (something i've thought about a lot) I would be WAY to far away from decent crack climbing. Or if I lived in Squamish (another thought i've toyed with) I wouldn't get very many opportunities to go climbing around the interior ranges. Especially noteworthy is the growing climbing interest in the West Kootneys and growing potential in Revelstoke. All of which can't be ignored by a local climber and these areas are a short drive away.